“Reverb Junkies” rocks with the rush of a riff, rolls and pushes and pulls like the tides. It’s a fun ride that never ends and always crests. "Reverb Junkies" screened in Mexico! 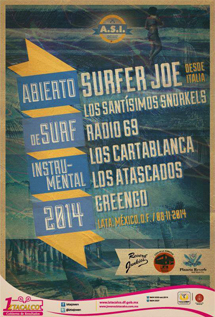 The film was shown on November 8, 2014 as part of the Abierto de Surf Instrumental 2014 . "Reverb Junkies" screened in Amsterdam! The film was shown on September 20, 2014 as part of the North Sea Surf Festival 2014 . "Reverb Junkies" screened in Italy! The film was screened on June 21, 2014 at the Surfer Joe Summer Festival in Livorno, Italy. "Reverb Junkies" premieres in Germany! The Space Rangers (featured in the film) hosted a screening on May 24, 2013 in Ulm, Germany. "Reverb Junkies" screened at the Winter Surf Festival, January 27, 2013! "Reverb Junkies" premiered at the BBC Music Video Festival on September 23rd, 2012!